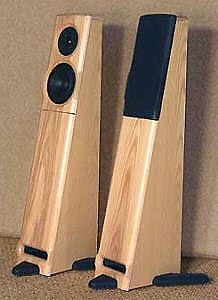 In 1995 -- and with far more than a faintly overheard overhead chirp -- the original $995/pr Kestrel put the then-unknown Meadowlark Audio company firmly on the map. Coincidentally, the repute of designer/owner Pat McGinty began to grow beyond the previous confines of SoCal. The haste whereby word of the Kestrel spread through the audiophile countryside should have prompted a renaming to "audacious cockerel". That's how loudly and persistently it advertised itself by sheer word-of-mouth. The petite Kestrel soon endeared itself to thousands of music lovers. It became prime example for what an affordable statement fullrange floorstander could be. It was even called "greatest bargain in all of audio" and similar pet names by more than one reviewer. Squeezed between the twin screws of inflation and the addition of far more expensive parts, it eventually did vacate the hotly contested thousand-dollars-a-month-rent 'hood. It escaped into more upscale digs, to greener pastures of weekly mowed designer grass and shiny cars parked curb-side. McGinty remained only too aware that the Kestrel's relocation once again created an arid desertification in the $1K "audiophile floorstander" neighborhood. Never meaning to contribute to its shrinking choises for sophisticated music lovers, he was merely biding his time. When his very own in-house cabinet shop finally gave him the necessary control and cost advantage to fashion a new statement $1000/pr tower, he didn't hesitate a brief New York minute. The Swift is the first new product since Meadowlark's move to upstate's Watertown last year. 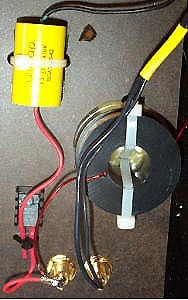 It introduces new cosmetics and an advanced form of the firm's championed transmission-line loading dubbed BASSIC. The Swift has since been joined by a rapidly growing flock of litter mates - the Swallow and Swan (whose combined feathered triptych I secretly refer to as Meadowlark's affordable S-Class); and the new Owl and Osprey. Suggesting an initial foul-up by UPS -- what a concept, eh? -- Meadowlark's shipment arrived in a single lone box. Packed cheek-to-cheek in a cozy 69 position, with the triangulated stabilizers tied to a separate cardboard insert, the 36.5" diminutive Swift didn't reach the hip bone on my 6.1' frame once set up and spiked. What added considerably to their petite appearance was the mere three inches of depth on top of the rakish, 7" narrow cabinets. They slope forward to achieve 10 inches of depth at the bottom. A front-firing transmission line terminus presents a heavily bullnosed 6-inch slot at the base of the solid 3/4", clear-lacquered natural Ash baffle. Above it is the firm's singing bird logo carved directly into the hardwood. The two-way Vifa driver complement consists of an exposed 1" softdome with a glossy sealer, and a polyfiber mid/woofer whose diameter barely exceeds 3.5" from inside-surround to inside-surround. When my wife first spotted the Swifts on the living room floor, she unsolicitdely commented on how great-looking they were. Small and elegant, their sloped baffle projects sounds far higher than their modest profile would ever suggest. In established Meadowlark tradition, the rounded-over driver baffle is decoupled not merely from the cabinet substructure but the driver-less remainder of the main baffle as well. Additionally, it's heavily sculpted to provide its inset transducers no sharp edges but rather gently curved slopes. This curvaceously organic theme continues with the floating solid-wood top cap. It isn't flat either but sloped off to the sides to follow the contour of the front baffle. The high-gloss acrylic back sits inside the veneered side panels by 1/4" and sports a mid-height terminal sub-baffle with single-wire binding posts, light-blue Swift logo and a proud "handmade in US" reminder. 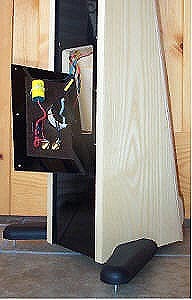 The minimalist three-part 1st-order network is mounted to the back of this sub-baffle and faces a completely sealed chamber to -- again in Meadowlark tradition -- isolate its parts from the deleterious effects of being bathed in high-dB driver rear-energy vibrations that make any speaker's cabinet the loudest part of the room. There's an overspec'd 450V Auricap, a heat-sinked resistor and one PerfectLay inductor hand-soldered together with silver solder. The hookup cable thru-holes into the main cabinet are sealed with epoxy: Clean, lean & mean, as are the remaining specs - benign 8-ohm impedance, 89dB sensitivity, 35 lbs weight. My overriding question for this review was simple: Would the Swift be the new "it" speaker, the one to recommend for a ca. $3k audiophile-approved system assembled, say around the phenomenal tube-hybrid RF-remote-controlled Unison Research Unico Integrated ($1,395) and a $600 Music Hall CD-25? Or the combination of Cairn Fog V2.0 24/192 CD player ($1,595) with integral volume control and a pair of nOrh/IRD 100-watt monoblocks ($295 ea.)? 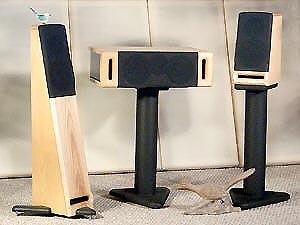 Or the Music Hall wedded to the nOrh $399 SE-9 or Antique Sound Lab $749 MG15 tube integrateds? I had all of these ancillary components in-house. I would duplicate multiple scenarios of price-balanced systems, which real-world music lovers could not only readily relate to but be advised to own. Before we proceed, a brief disclosure for those readers who indulge elaborate audio conspiracy theories of uncouth reviewer / manufacturer tie-ins. I was Pat's sales manager until 1998 when I accepted similar responsibilities for Soliloquy. My employ with him hence significantly predated the firm's relocation and crop of new products. For my personal sensibilities, this time frame is extended enough to allay any charges of impropriety. To boot, this wellknown connection easily cuts the other way. It prompts the ethical writer to attack products by such personal acquaintances with perhaps undue vigilance to counter perceived -- or self-inflicted -- notions of undue sympathy.